Gunmen numbering over 50 stormed Lafia, the Nasarawa State capital, yesterday, caused pandemonium when they shot sporadically in the air as they tried to capture a truck and its occupants from neighbouring Plateau State. Trouble started at about 5pm along Shendam road in Lafia as the gunmen, who were in hot trail of the truck conveying cattle and humans, refused to stop for searching by the youths in Ashangwa village, about 15 kilometers from Lafia. Upon trailing the truck to Lafia, the armed youths intercepted the truck, with registration number DNG 155 AA, Plateau, at project quarters, a few metres from Lafia government house where they unleashed their weapons on the occupants of the truck, shooting one on the leg and inflicting machete cuts on four others. At this point soldiers were promptly mobilized to contain the situation and a gun duel that lasted over 30 minutes ensued, resulting in the death of two of the gunmen and causing the others to flee. According to LEADERSHIP report, one of the victims of the attack, Alhahi Danladi Babaji, said the truck he was travelling in left Kanam in Plateau State at about 12pm before they were stopped by some gunmen at Ashangwa market who demanded to search the truck. He said since they were not government agents, the driver refused to oblige them, which infuriated the youths and they hased them into Lafia. Both the injured and dead gunmen were taken to the Dalhatu Araf Specialist Hospital (DASH), Lafia. 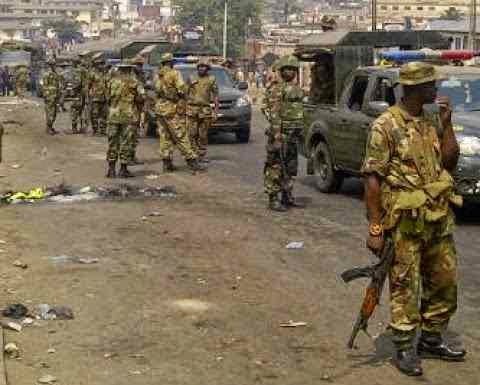 Tension in the state capital was high as a large number of armed security operatives were mobilized to the town to avoid further breakdown of law, with most of the major roads in the town barred from vehicular traffic.